Anyways, the mid xams were good and now i m burning the proverbial midnight oil for the sems( This is the only time of the sem that i study)..and after the sem, i m off 2 the Industrial tour, with my classmates, for 10 days from nov 7th.. wow!! i m so excited..
You must b wondering abt the misplaced pic at the header.. Well last week( just b4 the mids), i went 2 the DANDIYA NITE, at TAJ residency, on my friends insistence.. It rocked!!.. Initially, i decided 2 go just one day of the 5 days, but eventually got tempted to go one more day.. V here in Vizag are lucky 2 escape 4m any blanket timing( like 10pm in Mumbai).. V partied away( if i m allowed to call it that), late nights.. and returned home only after 3AM?? Main madhuri dikshit banna chahti hoon!! There are this typical girls who perhaps have spent more than Rs.1,000 to dress up for this five-day festival( The organising society here does it for 5, instead of the customary 9 days). They are armed with all the essential Ingredients: A designer wardrobe, a skin clinic back-rub, lots of hours spent at the beauty parlour and formal dance training a month before the festival starts. All this for that one goal: "Best Dressed Female Dancer". Step1-Step2-Step3 and turn around. This particular type although here to play Dandiya ends up doing some kind of a P.T exercise like the ones you did in school. No smile, no enthusiasm or the excitement of the music. It's more like the rhythm of the music just moving the body like a robot. I was in this category, a couple of years ago. Abhi to main jawan hoon.. Dressed in the most authentic attire for the night, this couple will be dancing like a pair from Bollywood movies. Steps perfect to the T and above all, a wide smile to top it up. Award: "BEST COUPLE FOR THE NIGHT". 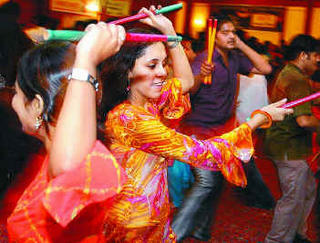 Then, there is this Garba round- the philosophy of which is still out of my comprehension.. er!!. Everyone gathers to form a large circle, and move their entire body like a drunken person in a circular kind of a chain.. the same thing happens for quite a large number of ciircles, until everyone including the band ppl are exhausted.. aagh!! Yes the steps seem 2 b rythmic to the beat, but i could never get over it.. pooh!! And of course, then there is this other type which makes up for the huge crowd who has come there with the only intention to "watch" the above mentioned types. "No playing and no dancing - STRICTLY NO.That is for the kids, let them njoi, while i sip my drink..."
have a laser hair removal site. You can find everything about laser hair removal as well as information on hair bows, color, extensions, and wigs. Please visit, check it out and enjoy! I recently launched a blog articles site exclusively for bloggers ... built entirely from articles submitted by bloggers. We all know that the best content on the web is produced by bloggers ... unbiased first hand knowledge, experiences and opinions. Nothing to sell and no hidden agendas! As a seeker of information or article content, you have access to this vast source of interesting and informative articles. As a contributor, you get the recognition of having your article published and seen by thousands of web users. The pride and satisfaction of seeing your article published in a prestige directory is hard to beat. Not all of us are gifted with the ability to write to professional standards of grammatical correctness ... as a result, many bloggers don't bother to have their articles published. We welcome an informal style of writing that matches your personality and fits in with your article content. We welcome articles that are uniquely based on your personal knowledge, experiences and opinions. All we ask is that your articles do not contain vulgar language, incite hatred or generally offensive. All this is absolutely free ... please come over and have a look at our blog articles directory for yourself. The visual-effects team behind CBS' upcoming SF disaster miniseries Category 7: The End of the World told SCI FI Wire that they managed to sneak their names and initials into several scenes. taking care of a blog is like taking care of a dog. Always moving around, changing, attracting attention, getting dirty... I must say you do a fine job of maintaining this blog. It's very good and I'm learning a lot from you. Thanks. please don't stop the great work you're doing.